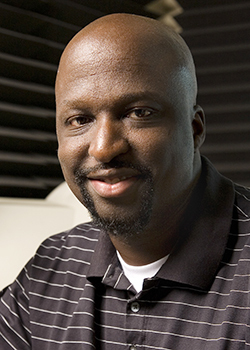 Sean T. Adams (’94), Abilene Christian University’s Young Alumnus of the Year for 2012, died Sept. 14, 2017, in Austin, Texas, at age 46. A memorial service will be held Sept. 23 at 1 p.m. at Westover Hills Church of Christ (8332 Mesa Drive, Austin, Texas 78759). Born May 24, 1971, in Oakland, California, Adams graduated from Fairfield (California) High School, where he starred in track and field, basketball and baseball. He earned a B.B.A. degree in finance and an M.B.A. (’98) from ACU, where he was an accomplished sprinter on Wildcat track and field teams that won two NCAA Division II national championships and finished runner-up in five others. He also was named Academic All-America. Adams was best known for a sportswriting career he began at orangebloods.com, the website covering Longhorn athletics for The University of Texas at Austin. He became a frequent contributor on the Longhorn Network, Inside Texas, ESPN, FOX Sports, FOX 7 Austin, CBS and the NFL Network. He was co-host of “The Bottom Line” on Austin’s 1300 AM The Zone. He became a popular motivational speaker who emphasized the importance of teamwork, specializing in helping people of all ages reach their own unique potential in business, sports and life. He was a keynote speaker at the 2011 NCAA Convention. Adams authored two books, Sports for Life: Daily Sports Themes for Life Success (2006) and It’s Okay to Be Crazy (2010). He was preceded in death by his father, Thomas Adams. Among survivors are his mother, Carolyn Adams; his wife, Karen (Vann ’96); a son, Damon; and a daughter, Alexis.